FThe world is growing quite fast and everything is changing at quite a rapid pace. But there are some things that have remained constant over the time and one of such options is that of the Python system. It can be said that it is the most sorted skills of the recent programming system. This has led a number of individuals to take up such certification courses in the Python programming currently. Also, a number of companies today prefer to hire candidates who are not only experienced but also are the holders of such certifications. But before taking up the certification course, there are a number of questions that the candidates should surely ask and get answers for. Some such questions and answers are discussed here so that the candidates can understand better about the certification course and can take up proper decisions about their career and future. Python became famous because of its easy to learn feature. The programming language is known to reduce down the development time with the help of the simple feature of compilation and its easy syntax options. Apart from this, a huge number of libraries of the programming language offers a number of options such as visualization, manipulation, and data analysis. All these amazing features or rather can be states as the benefits of the programming language Python has made it one of the most preferred one such as of now. Also, it can be said that the programming language has been considered as one of the best by many of the professionals by now. This has made a number of individuals to seek certification courses in Python to be a part of a great opportunity in future. A survey was conducted few times back by a third party, in which it was found that Python is the most high in demand programming language that most of the data scientists currently make use of. Soon, IEEE also supported this survey and came up with a result by the year 2018 that Python is one of the best programming languages in the current market. Python has established its expertise by now in a number of segments such as web development, game development, big data, web testing, data science, and smart devices. 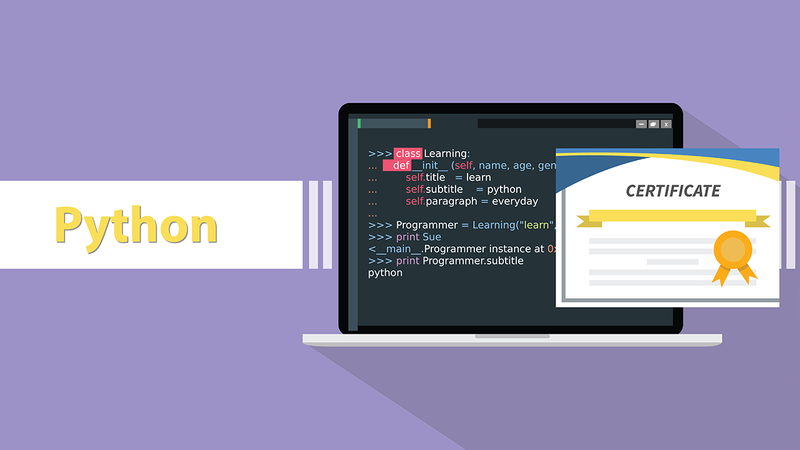 The need for Python certification has increased over the time because many of the companies across the world are looking forward towards people who can work on Python. Though the work on Python has increased but the numbers of people who are aware of the working system of the programming language are not much. For example, if a company wishes to develop an application in the particular programming language, it may happen that it does not have the required skillsmen who can come up with the app using Python. In this case, the company has to outsource the project to some third party and may have to spend a huge amount. On the other hand, if the company had a team of such professionals who are experts in the Python programming language, this situation would have not arrived. Hence, one of the best things that such companies do is to prefer hiring candidates who have a certification in the Python programming language achieved. So, if you get a certification course done in the programming language, you can be sure to get much higher career opportunities ahead. When the certification in Python is achieved, it can be helpful in a number of job profiles. Some of the important profiles for which the certification course can be highly beneficial are software engineer, research analyst, data scientist, Python developer, data analyst, and software developer. It has been noticed that there is a vast difference in salary in between the candidates who are experts with the candidates who are experts and also do have a certification added to their resumes. It was surveyed in the year 2017 and it was found that the Python programming language is offering some great numbers of candidates with high salary package. It was also found out from some of the job portals that more than 50,000 job options were there alone in USA that offers a high salary package for candidates who have certification in Python mentioned on their resumes. TIOBE, that is known for tracking the popularity of various programming languages have recently quoted that Python has taken quite a wide leap and now is at rank 4 worldwide. This means, the demand for the programming language is continuously increasing and because of this the career opportunities are continuously increasing by each passing year. Due to its various benefits, some of the best companies across the world has known its importance and has planned to make it a crucial part of the firm. As many as 41 different companies across the world have accepted Python to be their primary programming language. Some of these companies are quite well known such as Quora and Facebook. Some other well-known firms that have come up with Python to be their first programming language are Youtube, Dropbox, Reddit, SlideShare, Pinterest, Netflix, and many others. These many firms have started writing their new codes in Python. Not only this, Google has also taken up Python to be their secondary programming language and is looking forward to make use of it in various products in future. By now it has been known that how much beneficial in the Python language and how it can be beneficial to various individuals and firms. The open-source language is known to get integrated with other many technologies and then come up with better stability, higher productivity, and reducing development time. It is also helpful in debugging programs, improving results, and in many other ways. Initially, the programming language was just restricted to a few of the sectors such as physics, finance, signal processing, gas, and oil. But, now, there are also many other fields in which the programming language is stretching its wings. On getting enrolled with the curriculum course, an individual can learn a number of things such as the basics of Python, the fundamentals of Python, data structures, conditional statements, modules, regular expressions, object-oriented programming, and improving coding ability. But in order to get enrolled for the certification, the candidates need to fulfill a few of the eligibility criteria. Some of them are having a basic knowledge of the programming concepts, and also knowledge about the object-oriented concepts. The curriculum of the certification course has been divided into ten different segments and these are introduction to Python, Python installation, string operations, data structures, control and loop statements, functions and classes, using modules, regular expression, object-oriented programming, and case studies. Under these 10 segments, there are a number of topics to be covered such as history of Python, installing Anaconda, converting messy texts, various data structures, control statements of Python, Lambda functions, building modules, installing packages, learning tricks for expressions, OOPs, and many others. The world is prospering and everyone is in need of such systems that are hassle-free and can come up with the best results at the same time. In case of programming languages, Python is known to be one such option that is not only simple to learn but also is easy to adapt. Therefore, a large number of firms worldwide prefer making use of the programming language in different operations that they are conducting. Due to a high increase in the demand of the Python language in various firms, the need for professionals who are experts in the language has also increased. Therefore, in order to get the best outcome, these firms are hiring candidates who are experienced in various programming languages but are certified in options such as Python.